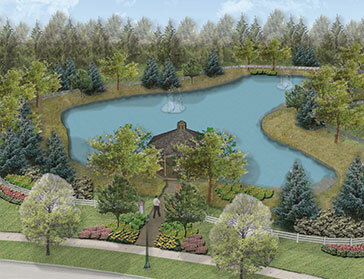 Lakes of Orange will be the first Green Certified Community in Ohio, located in Orange Village. The Lakes of Orange community embodies an innovative, natural, and eco-friendly lifestyle, while offering amenities such as a community clubhouse, pool, and tennis court. Lakes of Orange also features a custom-designed landscape that entails numerous walkways through a beautiful 95-acre development, including a 30-acre conservation area and a stunning acre-wide lake. Near the intersection of Brainard and Miles Road, the Lakes of Orange development is in minutes of retail shopping, restaurants, University Hospitals, while situated in the award-winning Orange School District. Miller Homes building lots: 115, 117 (Model), 118, 119, 130, 131 & 132. Our Lakes of Orange home designs—the 2-story Valencia (3470 sq ft +/-) and the 1-floor Cara Ranch (2488 sq ft +/-)—are the careful product of many years of building experience in northeast Ohio’s premier planned unit developments, which continues at the Lakes of Orange. All of our Lakes of Orange homes will comply with and be certified under the National Green Building Standard. The Valencia lives like a 1-floor home with the Master Suite, guest bedroom, 2 ½ baths and laundry room all on the 1st floor, but includes a well-designed 2nd floor with 3 roomy bedrooms, a double-sink full bath and spacious loft with an optional Master Suite design on the 2nd floor. For those buyers not needing 2nd floor space, we designed the Cara Ranch which is a 1-floor version of the Valencia with these added features.